We get it. 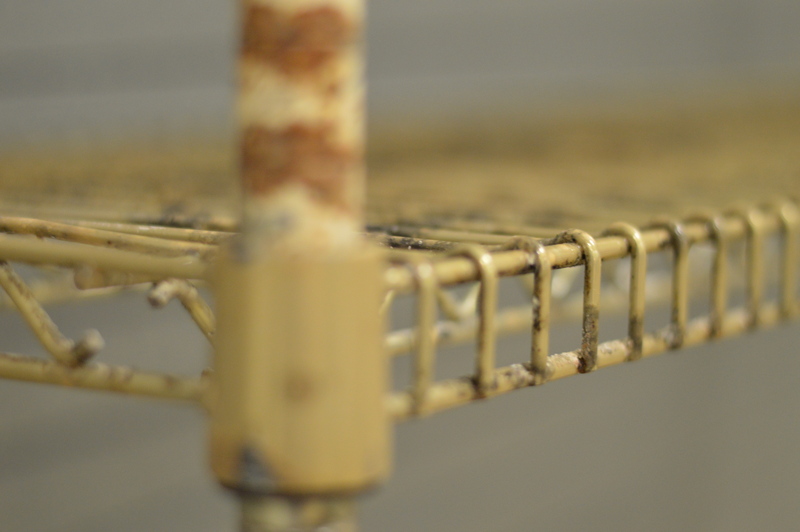 Shelving in commercial foodservice operations withstand a lot of abuse. The constant loading and unloading, food spills, sliding heavy #10 cans across the shelves-all of these things are destined to create some wear and tear on shelving equipment. 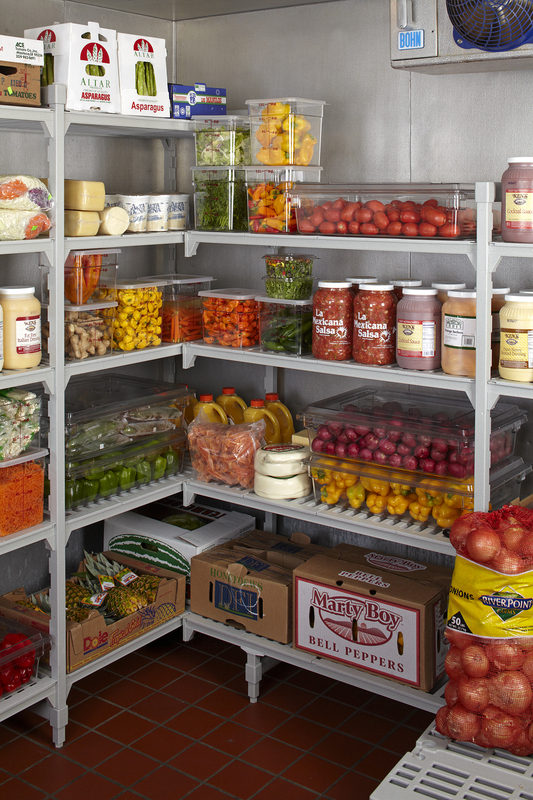 But there is no excuse for storing food on shelving that could potentially expose your customers to food contamination as a result of excessive rust or chipped paint particles. 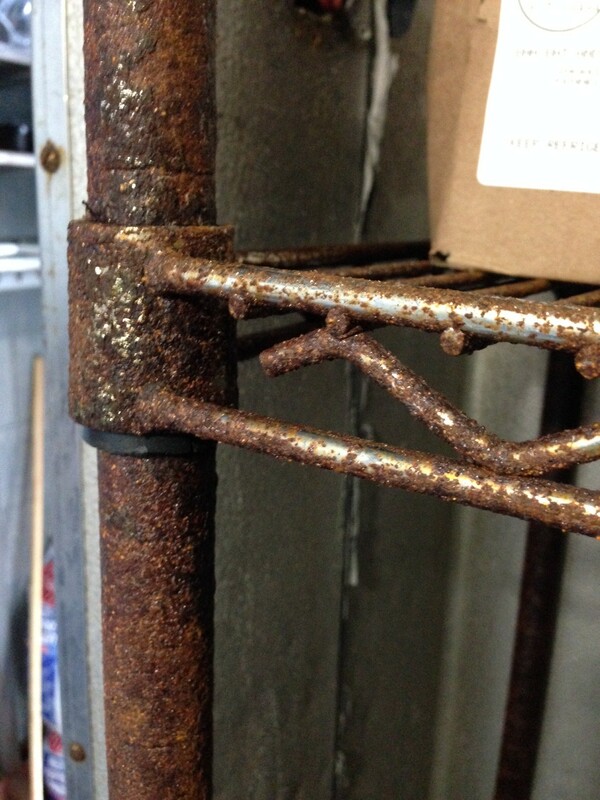 Over time, epoxy coated wire shelves peel, rust, collect build-up (if not maintained properly) and could lead to very unsanitary conditions if they come into direct contact with food. There is no easy way of getting rid of rust once it becomes exposed. This is especially true of walk-in coolers and warewashing areas, typically moist environments. It does not take long before shelving starts to rust and deteriorate. When operators get cited by the health inspector for their deteriorating shelving, they usually replace the bad shelving with more of the same type of bad shelving, thinking that this is the most economical route for their pocketbook. While wire and/or epoxy-coated shelving may be less expensive initially, over time as several replacements are needed, this recurring expense would far exceed the cost of investing in a rust-free product to begin with. In addition to having shelving with excellent long-term value, operators would be supporting good food safety practices from the start. “That old tired shelving has been there for you. Without it you could not successfully run your operation. But there comes a time when that shelving becomes more of a hindrance and risk to business and food safety. Flaking paint and rust are considered physical contamination hazards to food. Shelves that become impossible to clean due to unsmooth surfaces can harbor harmful bacteria. See, simply having restaurant approved shelving isn’t the answer; it’s just part of the answer. There are many shelving options available, the best advice I can give you is to take a look and add up the numbers to see what your shelving is really costing you in replacement costs, health code violations, kitchen inefficiencies and labor costs involved with cleaning.” – Victoria Griffith, CP-FS CEO/Owner of Griffith Safety Group. What separates Camshelving from other shelving equipment is that it is designed to withstand even the harshest environments. It is a non-corrosive, no-rust shelving solution that will hold up to the challenging storage demands of commercial operations. It will also help operators eliminate unnecessary, inconvenient and costly replacement or refurbishment costs. A kitchen should be set-up for maximum cost savings, labor efficiency, food safety and functionality no matter the size of operation or the budget. Camshelving helps operators do all of this and much more! See the many ways that Cambro products can help foodservice operators Break Free and Pro Up at www.cambro.com/pro.